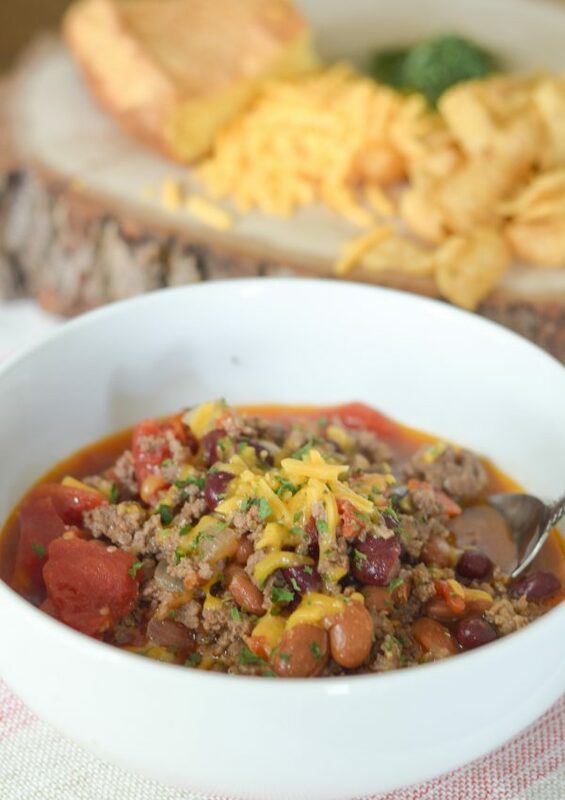 Get ready for a wonderful, easy fall meal with this Instant Pot Hearty Bean Chili! It’s finally fall! Well, maybe it isn’t officially fall, but with it being just a day or so away…it’s close enough! We have already started the season with several varieties of chili the past few weeks. I have to admit, this time of year is my absolute favorite. The weather and the food is perfect. Plus, making chili for dinner is so simple and delicious. I think it’s timed perfectly since this is when so many activities start to pop up again. This year our son is playing flag football, so our weeks are even more busy than years past. It’s basically vital that I have some quick meals on the menu like this Instant Pot Hearty Bean Chili to allow us to have dinner at home. 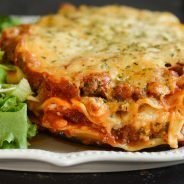 I try to avoid eating out if I can, to do that though requires planning ahead and adding meals that utilize the instant pot and slow cooker to our menu. 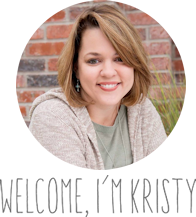 One thing that I happen to love about this chili recipe is that you can cook the meat right in your instant pot. I would suggest getting a very lean beef so that there is no need to drain the meat. 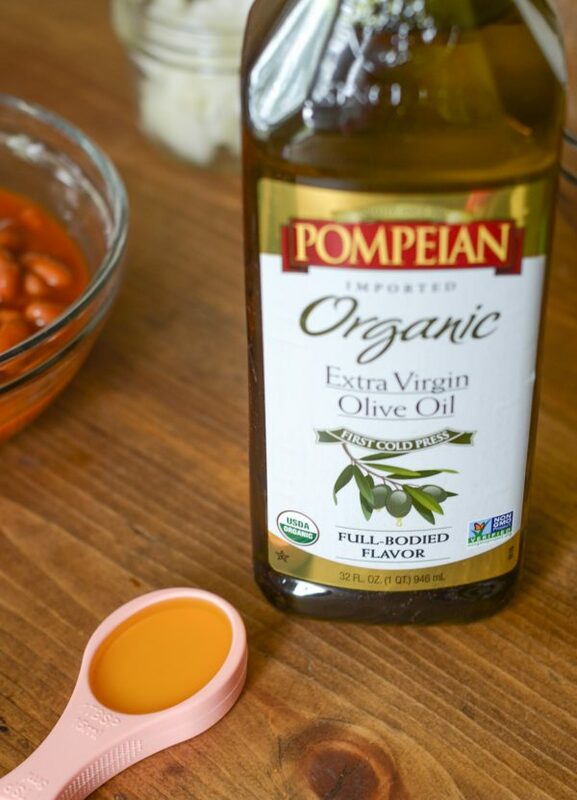 I always cook the beef with Pompeian Organic Extra Virgin Olive Oil. The oil gives the beef a wonderful flavor and it just takes this chili to a whole new level. I also add in the onions as well to sauté those in the oil. 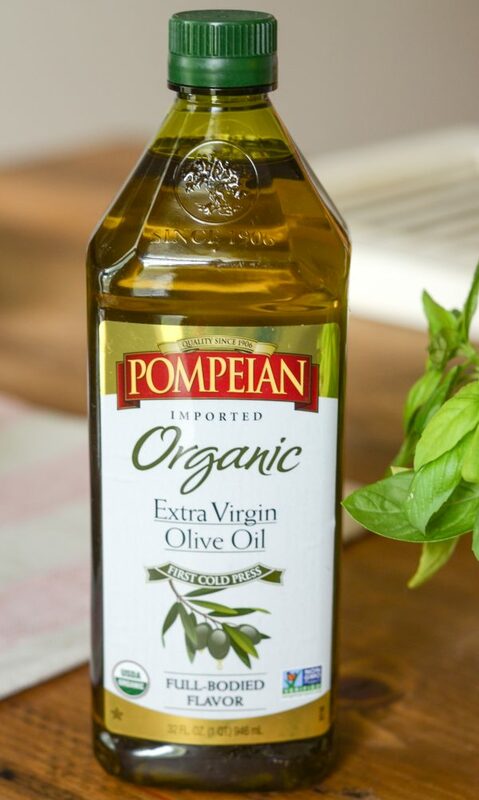 Why is it best to use Pompeian Organic Extra Virgin Olive Oil? This oil has a very robust flavor and it’s USDA Certified Organic. That fits very well with the organic grass fed beef in the chili too. We live in cattle country, so it’s actually not too hard to find local, grass fed beef in this area. 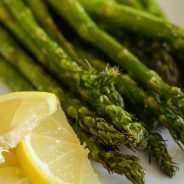 It brings a great flavor to the entire dish, plus it’s nice to know that we are supporting our local farmers as well. Of course, the biggest benefit is that this chili uses quality products that I can feel good about feeding my family. This process takes about 10-15 minutes, once this is done, it’s simple to add the remaining ingredients. The entire thing is cooked on high pressure for 4 minutes. That’s right, just 4 minutes! 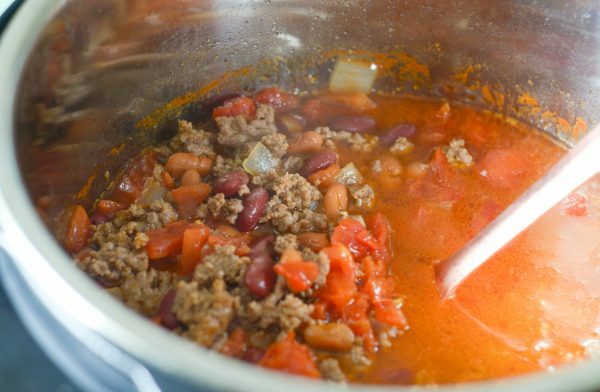 Once you add in the time it takes to build the pressure, it should take just about 30 minutes from start to finish for Instant Pot Hearty Bean Chili. 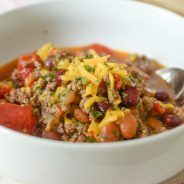 What beans should I use for instant pot chili? I decided to stick with regional influences for our chili. 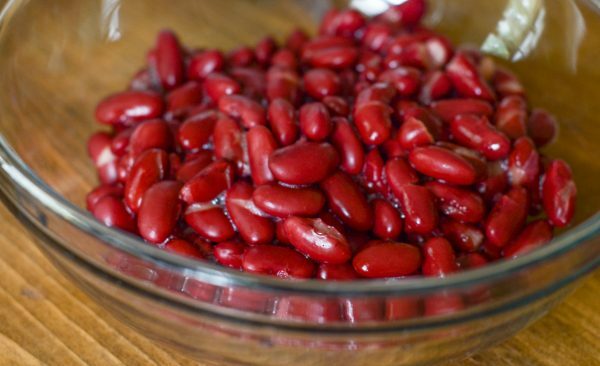 In Oklahoma, red beans are well known to be in chili. I opted to use red beans along with canned chili beans. 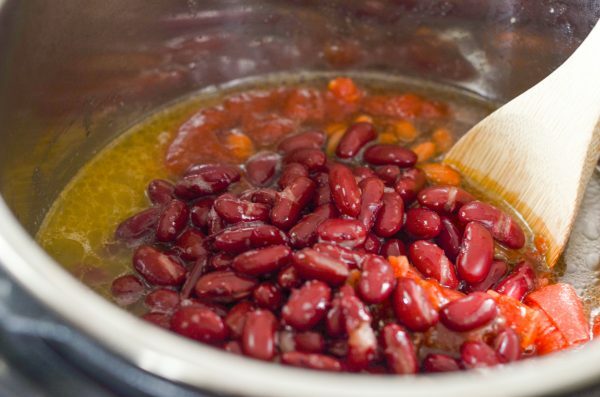 Red beans are actually a great source of nutrients too, which gives an added bonus to this Instant Pot Hearty Bean Chili. It proved to be a great combination and added in some delicious regional flavor to our chili as well. How long do you cook instant pot chili? It only takes 4 minutes! I have found that almost all soup and chili take about 4 minutes in the instant pot. I cook them on high pressure for 4 minutes, then do a quick release and serve. Remember that it does take a few minutes to build the pressure within the pressure cooker that you are using. 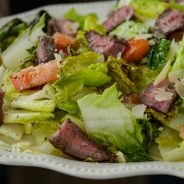 Can you cook the beef in the instant pot? Yes! This is a one-appliance meal. 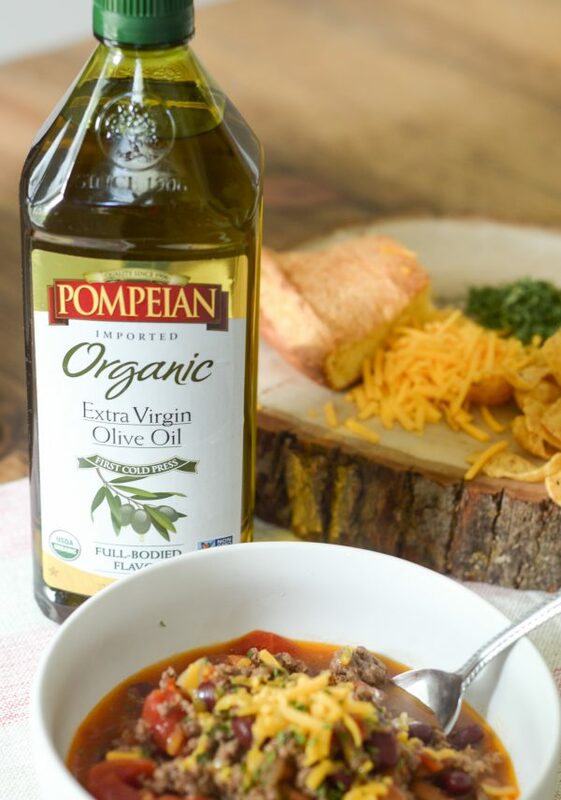 Simply sauté the ground beef using the sauté function on the instant pot, be sure to add in Pompeian Organic Extra Virgin Olive Oil first, then add in the beef. 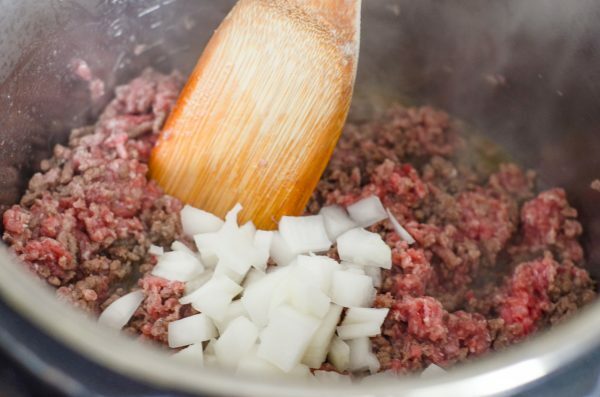 Once the beef is just about well done, add in the onions and cook those for about 5 minutes before adding the remaining ingredients. Once you have all of your ingredients ready to go, it’s time to get back to homework and all those fun math problems, while dinner is cooking. 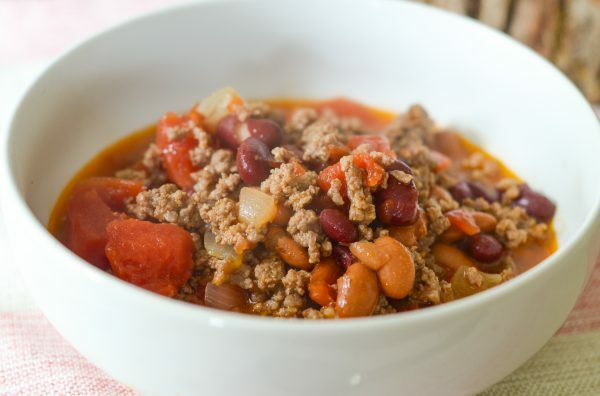 What should you serve with instant pot chili? 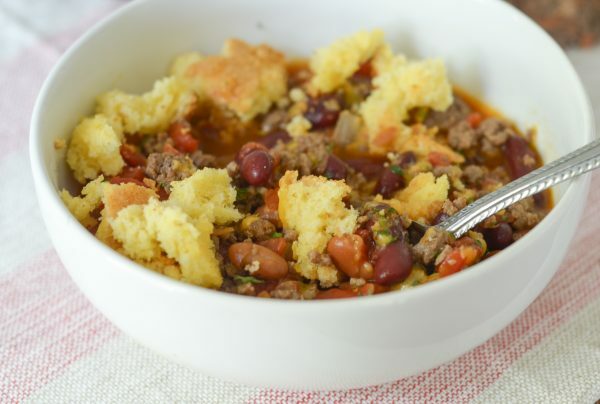 We typically have a debate in our home on if chili should be served with corn chips or cornbread. I grew up with chili and cornbread, meanwhile my husband always had corn chips. These days, we do both! 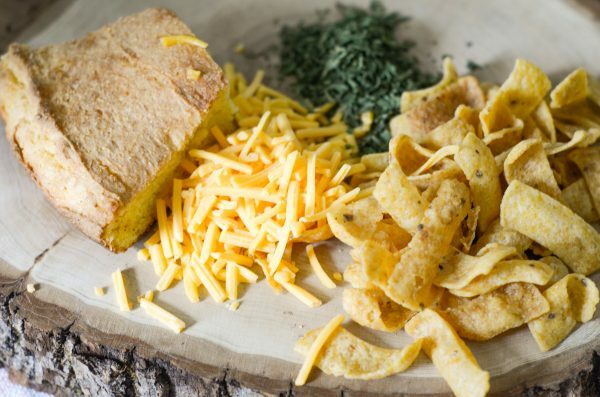 We have a selection of cornbread or corn chips, and we let the kids choose. I have to admit, I actually like to have a little of both in my chili these days. Are you ready for dinner? 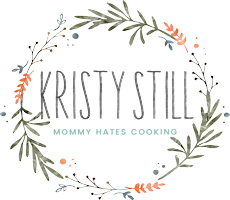 It’s time for Instant Pot Hearty Bean Chili! 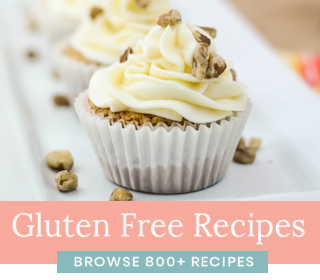 Be sure to show us what is #TrendingintheKitchen at your home too! 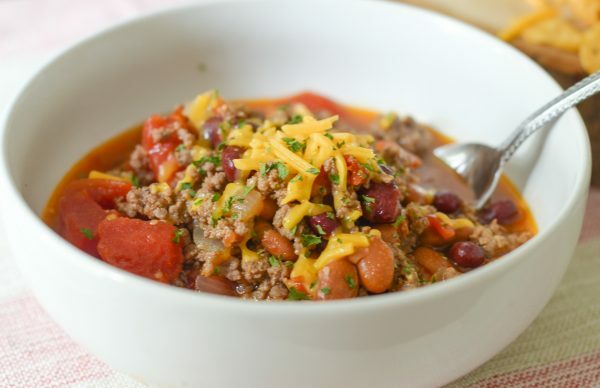 Make this Instant Pot Hearty Bean Chili with a variety of beans, grass fed beef, and delicious olive oil to give it a robust flavor. 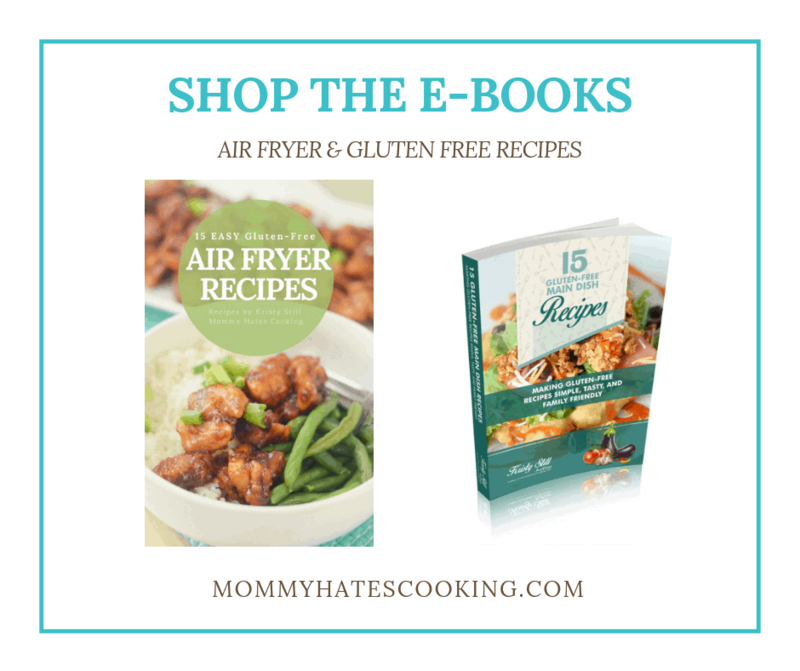 Place instant pot on the sauté function. Add the olive oil to the bowl of the instant pot. Add in the ground beef and cook until nearly done. Add in the onions and continue cooking until both the ground beef is done and the onions. Add lid to the instant pot and be sure that the vent is sealed. Quick release the steam once done, stir, and serve. 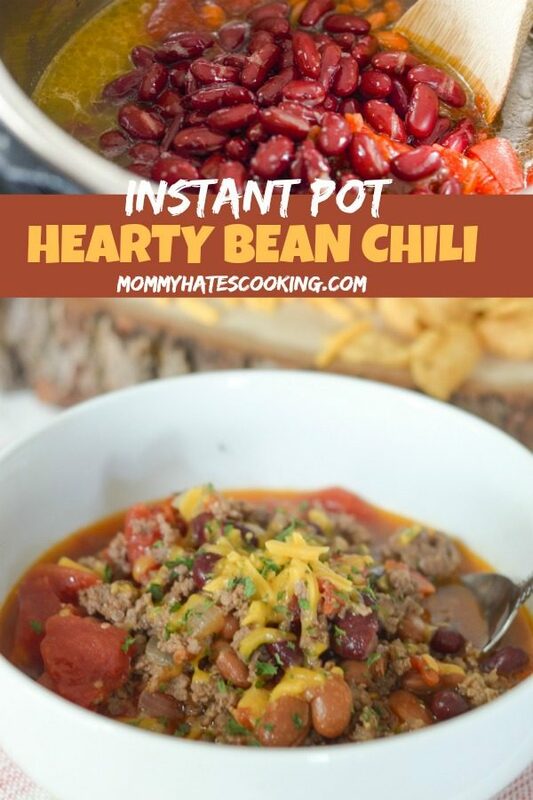 Looks great we love instapot chili! Thanks for the tips! Thank you for sharing on Merry Monday! Hope to see ya next week!